Sometimes the best way to say “I love you” is with a heart. Why is that, though? Historically, the heart shape has been an iconic symbol for centuries. This shape is believed to date back to the 13th century in 1225. According to TIME, “the medieval French love poem Le Roman De La Poire by Thibaut[…]is the source of the idea that a person in love can ‘give’ his or her heart to the beloved.” By the 14th and 15th centuries, this heart took on the scalloped bottom shape that was more in line with the shape we now recognize. “By the 18th and 19th centuries,” says Evan Andrews of History.com, “[the heart shape] had become a recurring motif in love notes and Valentine’s Day cards.” This shape has since been the worldwide symbol of emotion, not far from its symbolism centuries ago. Our heart pendant jewelry is the perfect testament to this iconic shape, perfect for occasions and holidays. Our designer heart pendants feature one option in two-tone white and rose gold. 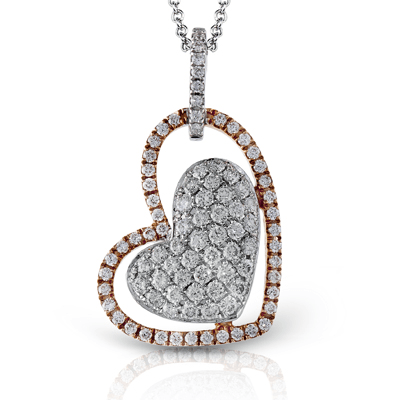 The outline of the heart features small round cut diamonds in rose gold. Inside the heart frame lies a solid white gold heart, encrusted with dozens of cut white diamonds. This heart is affixed to the outline so as to not fall out. This double heart shape has a dimensional appeal that helps give life to the piece. Even the pendant’s white gold bail is decorated in white diamonds. All in all, this piece is over half a carat in diamonds! This contemporary heart pendant will charm your loved one with its two-tone appeal, drawing admiration from friends and family alike. These make wonderful gifts for mothers, too! A pendant like this will show mom just how much you cherish her! Pair this pendant with seasonal wear like sweaters or cowl neck blouses for a classy look. This will be a unique and memorable addition to her jewelry collection. One of the best qualities about these designer heart pendants is that they’re perfect for any woman in your life with their timeless charm. If you have any questions about our diamond heart pendants, please contact us and we’ll be happy to assist you.